The six clocks in the house, fascinate me. Even though they do not work, I find them fascinating! The first clock, shaped like a large bucket, was carried by a brass handle on the top. The clock sits on the pier table in the British room. 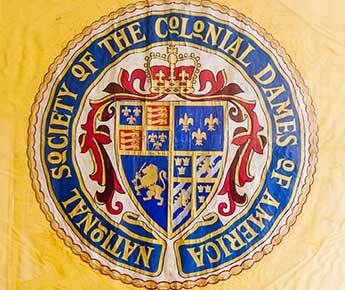 The British were here in Mobile from 1762 until 1780. 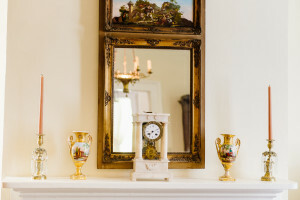 The second clock is the Banjo clock in the international dining room. Shaped like a banjo and made in Boston in the 1800s, this clock is quite lovely. The third clock at the top of the upstairs is really a beauty! It is a wedding clock. The top part where the face of the clock is found, was made in Amsterdam in the later part of the 17th century. 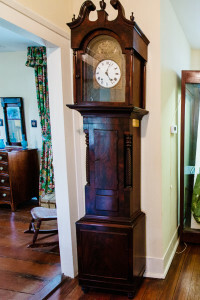 The bottom part, made in England in the early part of the 18th century, was married to the original half of the clock. The Boudoir Clock is Sister’s favorite. The fourth clock is found upstairs in the French sitting room. This large brass clock is early 18th century. The lovely little Boudoir Clock is made of white marble and is my favorite. The Seth Thomas clock across the hall is large and impressive,with the weights that are too large for it, so it doesn’t work.